Wiimote FPS players sensor bar tip. I had just recently started playing Call of Duty Black Ops 2 again, after not playing it for a long time. 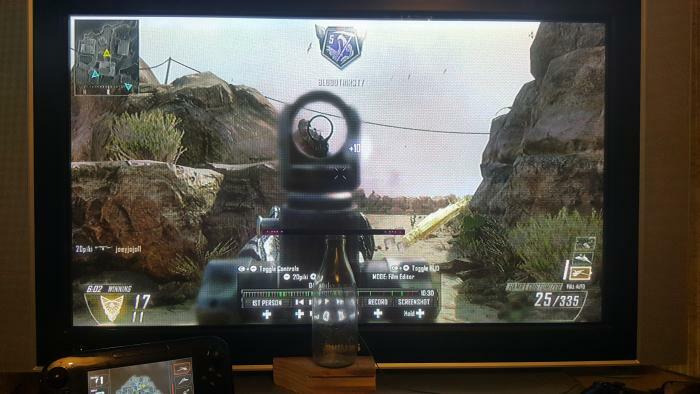 I'm a big fan of playing first person shooters using the Wiimote, so naturally I'm using the Wiimote to play COD. Anyway, I was playing around with sensor bar set-ups and came up with this configuration. I don't know if this has been discussed before but I thought I would share it anyway. The picture as a snapshot of my television, and one of my games being replayed in theatre mode. If you look at the bottom of the picture, you can see a block of wood, on top of the block of wood is a glass milk bottle, and on top of the milk bottle is the sensor bar(you can see the red IR LEDs at each end of it). What this does for me, is align where my Wiimote is pointing to where the cursor is sitting in the very middle of the screen, so if I point the Wiimote at the centre of the screen I'll know the reticle will be there. This trick has improved my KD ratio and earning killstreaks. This method has really worked for me, but what I would like is for some of the wiimote players in this community to try out this method to see if there is any real substance in this mod. If you've got some fishing line, you can rig it to hang in the same place, gets rid of the bottle. But, it doesn't seem to bother ya or your score. All you need now is to build the TV with the sensor inside. This thing started out as light bulb box sitting on a dark coloured vase, with the sensor bar on top. Even though they blocked the screen, you barely noticed them. The milk bottle is practically invisible, but I still may build a more elegant solution.